“A wry, tender story about the tribulations of flesh and ink – and funny as hell. 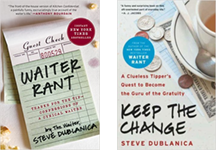 I’ve never understood why people get tattoos, but after reading Jeff’s excellent book I may just get one myself.” – Steve Dublanica, the author of Waiter Rant. Congrats Jeff! Hope it’s a bestseller! This sounds like something my daughter would enjoy. You might’ve actually made a sale! You did make a sale. I bought one on your advice. Loved you book…looking forward to this as well. I also bought Clublife on your recommendation and it was a good read as well. Are you really going to get a tattoo? As one who has tats (both shoulders are covered) this looks like a good book to buy. The so-called “underworld” of tattooing is a fun place to explore. Lots of interesting folks out there – including some of the tattooists. And I’m a Presbyterian Elder. I used to be a correctional officer (now there’s a venue for your next “tipping” adventure… not really kidding much), and the inmates used to tease me about being so straight that I couldn’t like long hair or tattoos. One of the inmates bet that he could draw something I liked, and asked what I wanted. I said a penguin. He drew it, I liked it. So during a cell search I confiscated it because they weren’t allowed to have tat patterns (not my rules). Then I took it someplace else and did get it done. I was nice enough to show the inmate who drew it, though, after I got it done on my ankle. Waiter, I miss your daily waiter stories, buy I am glad you quited. You deserve much more. You are one of the best writers I ever known. Congratulations. I didn’t care for that book, myself — too much rambling about his personal life instead of stories about the business, which is how it was billed. That said, I’m glad to see yours is out in paperback — I’ll have to pick up a copy. Take a look at community mental health non for profits. Amazingly a dark underworld there. Many times it is hard to tell between the patients and professionals. I shudder at the word ‘tat’… just saying.